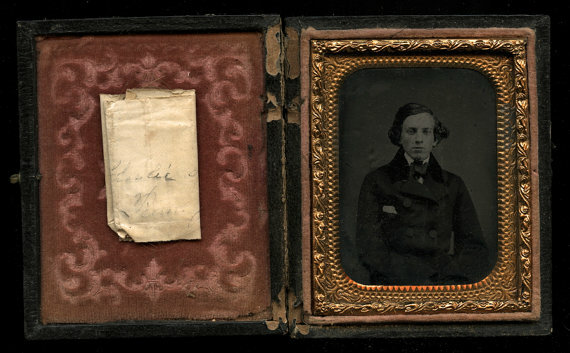 When I bought this Civil War era Daguerreotype of a nice looking blonde haired man in an overcoat, it came with a little surprise. Tucked behind the image in a folded up piece of paper is a lock of blonde hair. On the paper is written the name 'Charlie Sloan' and beneath it looks like a city, but time has unfortunately faded the writing. One would assume the hair belongs to this gentleman, and that he most likely died shortly after the photo was taken as the hair is all blonde, no gray at all. It's a great piece in very good condition.